Guest article: Why didn’t the Seahawks draft the right guy? Why Didn’t The Seahawks Draft The Right Guy? For example, a study of people spelling words found that those who were 100% confident that their answer was accurate were only correct 80% of the time. A similar study of math and verbal questions found that 75% of participants overestimated their ability to answer multiple choice questions correctly. I recently read a very interesting article about a study by two economists who applied the principle of risk diversification to the NFL draft. They determined that teams that trade down in the draft to stockpile extra picks are more likely to draft starters and Pro-Bowlers than teams that trade up. And they get those players at a lower cost. They also found that teams that trade down in the draft win more games. Does this sound like the Seahawk model? Not surprisingly, the Seahawks were mentioned as an example of a team that successfully built their team through the draft. Check this article out if you complained about John Schneider trading down in the draft and you might never complain again. So, why do teams trade up? They concluded the answer is the confidence bias. Some NFL executives are so confident in their ability to analyze player prospects that they will pay a steep cost to trade up for Sammy Watkins or RGIII even though the objective data shows that their course of action is less likely to produce a successful team. So, now that we are all aware of the confidence bias, how are we going to react differently to the next Seahawks draft? Human nature being what it is and all of us being humans, most of us will react by trying harder to pick the “right guy” next year. Studies on the confidence bias show that we become more confident with more data so we will seek out more information about players (“What is his SPARQ rating?”) or the Seahawks drafting philosophies. How many of us heard John Schneider talk after the draft about how a prospects perceived ability to survive in the super-competitive environment of the Seattle locker room has gained importance in his player analysis and thought, “Now that I know this, I will be better able to correctly predict next year’s pick.” The studies show that the confidence bias increases as we receive more data even if the data is incomplete or does not produce additional accuracy. Having some idea of a player’s “grit” may be helpful, like knowing their SPARQ measure of athleticism, but we will never know a player as well as the Seattle front office. We have all heard it before but now we have scientific analysis to support the conclusion that the best thing we Seattle Seahawk fans can do to prepare for the next draft is to prepare to be surprised. The addition of Kevin Williams is becoming more intriguing by the minute. There were hopes for Kenneth Boatwright heading into the off-season. He’d gained weight and figured to be competing with a young group of defensive linemen trying to fill the gaps left by Red Bryant, Chris Clemons and others. Instead the Seahawks have turned to a seasoned veteran and Boatwright is left without a job. It’s a cautionary reminder that we know so little about these possible diamonds in the rough. None of us really know what Boatwright is capable of. His most redeming quality was the fact he’d been given a chance by this front office. That reputation could get him a gig elsewhere (Welcome to Jacksonville). Yet ultimately we knew nothing of his actual talent. Even less than a guy like Greg Scruggs, who at least had some playing time as a rookie. Williams is a proven commodity in the twilight days of his career. Having lost so much in terms of experience up front, that could be valuable. It’ll be up to the other young players to make sure they remain part of the rotation moving forward. The interior defensive line looks solid on paper. Brandon Mebane, Tony McDaniel and Kevin Williams is a nice rotation at tackle. McDaniel is also capable of playing the five technique — and the likes of Jordan Hill and Scruggs will get a chance to earn playing time inside. It’ll be interesting to see if Cassius Marsh can have an early impact as an inside-and-out rusher. And what does the future hold for Jesse Williams? Michael Bennett also stands to play in multiple spots and increase his snap count in 2014. Kenneth Price was also released in favour of another running back — Demitrius Bronson. It was a nice story for Price — given a shot by his local NFL team as an UDFA. His friendship with Russell Wilson added a dynamic. Even so, he had limited upside as a pro-passer and never seemed likely to usurp a Terrelle Pryor or B.J. Daniels. Bronson spent two years at Washington before switching to Eastern Washington. He tried out for the Seahawks last month. The other big story at the start of minicamp is the appearance of Marshawn Lynch. There was a lot of talk last week about a potential contract dispute and maybe even retirement. Although he didn’t work out today (and there’s no reason why he would) — he did at least turn up. Which is a positive sign for his future with the Seahawks. Seahawks sign Kevin Williams & will Marshawn Lynch retire? Even during the most mundane section of the NFL calendar, the Seahawks find a way to make life interesting. Kevin Williams is 34 this year and will eventually retire as one of the greats. Six Pro Bowls. Five all-pro nominations. He was named in the ‘all-decade’ team for the 2000’s. Very few defensive tackles play for ten years. Even fewer play for ten years at the level Williams achieved in Minnesota. Seattle is thinner on the defensive line going into 2014. They’ve lost Red Bryant and Chris Clemons. They’ll need to find a replacement for Clinton McDonald. There’s a lot riding on the young bucks stepping up to the plate. Yet this is the one area Carroll’s Seahawks haven’t had too much success. They haven’t drafted young defensive lineman and then transitioned them into key role players. Michael Bennett and Cliff Avril were bought in. Bryant and Brandon Mebane were inherited. Clemons was an established veteran even if he carried a journeyman tag. None of the draft picks — including the likes of Bruce Irvin, Jordan Hill and Jaye Howard — have had a major impact. Hopes are high for Gregg Scruggs, Hill, Benson Mayowa and co. But with potential comes uncertainty. Even in an ageing frame, Carroll knows what he’s getting from Williams. I see him working inside as a three technique. That’s a near certainty. But it’s going to be interesting to see how Seattle’s line shapes up next year. Carroll has promised evolution — yet he hasn’t stated the scale of the changes. What we do know is — Williams will be stout, he’ll offer some pass rush and he’ll be a mentor for the younger guys. And his value in that sense shouldn’t be underestimated. I find this developing Marshawn Lynch saga both surprising and unsurprising. I’m surprised because of the timing. June seems like a strange time to have an epiphany on your contract situation or even your career. I’m not surprised because I remember these remarks after the Super Bowl victory in this piece by the MMQB. This stuck in my memory. I sense Lynch was joking around with the teammates mentioned here, but amongst the laughs was an element of truth. Your body takes a pounding at running back. And nobody’s body has taken more of a pounding than Lynch’s. The Seahawks started collecting RB’s even after Lynch signed his new contract in 2012. They drafted Robert Turbin in round four that year — and then Christine Michael in round two the following season. It wasn’t just an acknowledgement of planning ahead, it was a nod to the importance of the position in this offense. 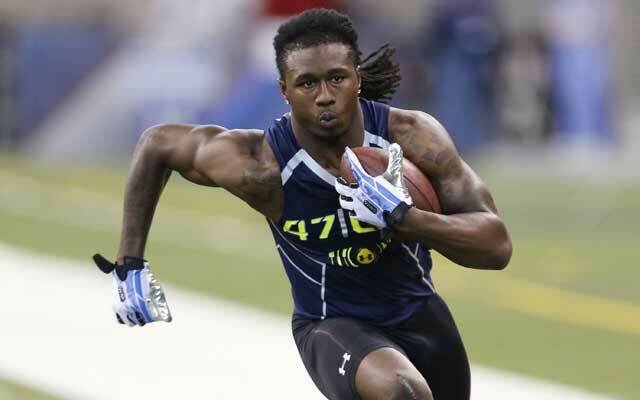 Seattle wants a playmaker or two at running back. And they don’t want a sudden drop off if and when Lynch calls it a day. If — as Ian Rapoport suggests — he is considering retirement, I think he might be better off just making the decision. If his body can’t take another beating in 2014, then why struggle on? Seattle has a player in Christine Michael who appears ready to have an impact in the NFL. He’s dynamic. He’s explosive. And he’s hungry. The Seahawks can ill-afford to carry Lynch as much as he can’t afford to struggle through another year if his body screams “no more”. Of course all this talk could just be a tactic to get a better contract — something Lynch is also after according to reports. His representatives should know there’s very little chance of a breakthrough there. The NFL just isn’t paying running backs any more. Lynch is actually quite fortunate he got a new deal with $17m guaranteed. If the Seahawks won’t pony up — and they probably won’t — what then? Of course Seattle won’t waste much time on league-wide trends. If they think he’s just too important to lose, they might be willing to negotiate after all. It still seems unlikely however, given the depth they have at the position. It’ll be a sad day when Beast Mode hangs up the cleats. To an extent it’d be incredibly Lynch-esque if he did just make a dramatic announcement and walk.No doubt without holding any press conference. That day appears to be a lot closer than anyone imagined. The Seahawks are a team that broke away from conventional wisdom. That’s well publicised by now. It’s almost a little tiresome to keep bringing it up. But it’s true. And if I were an owner looking to move in a new direction, I’d be looking at Pete Carroll’s work in Seattle with envy. There’s nothing overly scientific here. They look for rare athletic qualities and guys with the attitude to compete. Of course it’s much more sophisticated than just that, but it’s nothing a competent and experienced NFL staff can’t at least attempt to emulate. It doesn’t even have to be a carbon copy. It’s just about knowing what you want to do and getting after it. What constitutes one of ‘your’ guys? You can open up the competition in camp and let them go for it. Let the best man win. Always compete. But it’s also knowing when to make specific moves. Taking calculated risks and not forcing the issue. Seattle turned over every stone to find a winning formula. They invested in players they could believe in — they didn’t invest heavily in specific positions because, well, that’s how you build a team. The Seahawks went from lifeless also-rans to Champions in four years. You’d think teams would be scrambling to try and replicate it. And then you look at why some franchises just can’t get out of their own way. Buffalo — forever in the shadow of New England (at least in my lifetime) — pick the worst draft for QB’s in years to go after their guy in E.J. Manuel. He struggled, he got injured. The Bills panicked. Now they’ve blown two first round picks on Sammy Watkins in an attempt to make life easier for their young quarterback. I like Watkins. But here’s the thing — Atlanta moved up 20 slots to get Julio Jones in 2011 and gave up two first round picks to do it. Buffalo pulled the same move (with the same trade partner coincidentally) to move up five slots. It’s a kings ransom. And now they’re not only banking on Watkins proving he was worth the outlay — their banking on their first round quarterback being competent (and healthy) enough to supply the ammunition. Buffalo’s key draft stock from 2013-2015 is tied into two players. The future of the coaching staff and front office will be forever connected to the performance of Manuel and Watkins. Even if the plan succeeds it should be seen as reckless and impatient. It’s almost the exact opposite of Seattle’s approach. Perhaps there are other things at play here? The eventual sale of the team could lead to jobs being lost. This could be an aggressive attempt to prove a point before major changes occur at the top. Who knows. But they couldn’t have done things any more different than Seattle. And I just find that very confusing. I also find it interesting personally to critique Buffalo because to be honest a few years ago I probably would’ve given their pro-active approach a huge thumbs up. Teams like Indianapolis, Green Bay and New Orleans placed their trust in being able to put up huge numbers behind a prolific passer. If Peyton Manning, Aaron Rodgers or Drew Brees got injured — it was over. But while ever they were healthy and active their teams had a shot. I passionately thought the Seahawks needed that at the start of the Carroll era. In 2010 we spent great time discussing the minimal pro’s and significant con’s of Jimmy Clausen, Tim Tebow and Colt McCoy. My final 2011 mock draft had Colin Kaepernick posted at #25 to Seattle. 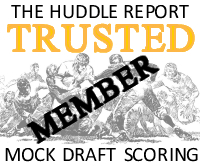 We also debated and dissected Blaine Gabbert, Cam Newton, Andy Dalton and Jake Locker. Who could be Seattle’s 40 TD machine? They didn’t draft any of those players. They waited. And waited. And then found a player they could believe in. The man who would quarterback this team to a first ever Championship. And they did it their way. Running the ball, playing great defense. Not relying solely on the man under center being healthy, working in a flawless pocket. When you see teams trying to build around one vital player and position, you almost have to smirk. Yet you do it — or at least I do — with the knowledge I would’ve made exactly the same mistakes before Carroll and co. arrived in Seattle. Following the growth and development of Carroll’s Seahawks has been a great lesson in team building. We are better educated fans because of the experience. We are more aware. And yet there are still teams in the NFL making the same old mistakes. Far from the finished article but one to monitor going forward. We talked about him in greater detail here. There’s a degree of physical development required plus some technical refinement. But Golden has as much potential as anyone considering he’s a recent JUCO transfer with limited experience. With Kony Ealy and Michael Sam turning pro, there’s a great opportunity for both Golden and Shane Ray in 2014. Pass rusher could be a long term need for Seattle. So the technical problems are finally solved. Let’s celebrate. Just a quick update as I’ve received a few emails recently asking what the latest is. My laptop is in for repair and fingers crossed will be back with me later this week. Apologies for the prolonged absence but hey — at least it waited until after the draft.